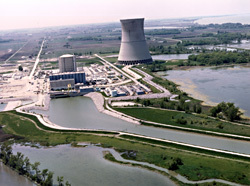 NRC Will Make Sure FirstEnergy Got It Right: What Caused the Cracks in the Davis-Besse Nuclear Plant’s Shield Building? What caused the cracks in the shield building at the Davis-Besse nuclear plant and what needs to be done to ensure the building’s long-term safety? The NRC’s current inspection is focused on making sure we are satisfied with FirstEnergy’s answers to these questions. We’ve previously written about the NRC’s exhaustive efforts to ensure the cracks found in the shield building around the Davis-Besse nuclear power plant’s containment structure are not compromising current safety. We will continue to take the necessary steps during the current inspection to make sure that the reasons for these cracks are well understood and FirstEnergy’s proposed actions to ensure the building’s long-term safety will accomplish this goal. First, we studied the initial review done by the plant’s owner – FirstEnergy – in their root cause analysis to gain a better understanding of how the company arrived at its conclusions. Then, a team of four NRC inspectors went to the plant with about 80 questions associated with this initial review. They recently finished a week-long inspection verifying the initial information and questioning the company’s conclusions. While at the plant, the NRC inspectors also reexamined the condition of the shield building. By the time the company submitted the root-cause report to the NRC on February 28, in accordance with the plant’s commitment to the agency, our inspectors had already completed observations and verification of the company’s shield building testing. Months before, NRC inspectors had traveled to laboratories in California and Colorado to directly observe tests of concrete samples removed from the Davis-Besse shield building. These tests are a key component of the cracking analysis and NRC inspectors need to have confidence in their quality. • thoroughly evaluating the company’s proposed corrective actions to make sure they are sufficient to maintain the long-term safety of shield building. The NRC’s independent inspection will continue to challenge the company’s the root cause report and planned corrective actions until we have confidence in their thoroughness and accuracy. The NRC will discuss its conclusions on the adequacy of FirstEnergy’s root cause analysis and proposed corrective actions at a public meeting to be scheduled after we complete our inspection. The details of this inspection will be outlined in a publically available report. great article! thanks for sharing such good info.